Many accolades have been bestowed on this premier public facility located directly across from the Ocean City skyline. Arthur Hills has blended spectacular, windswept, shoreline holes with others featuring secluded, tight, tree lined fairways to produce a very challenging and visually stunning golf experience. 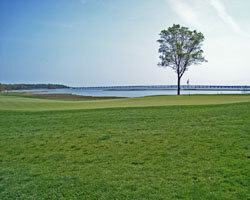 The front nine is heavily exposed to the elements playing along the shoreline and the fingers of land jutting out into Assawoman Bay. 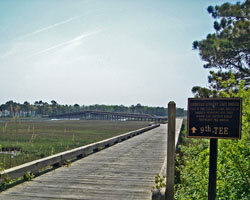 A 1500 foot cart bridge leading to Hole 9 takes you to a secluded backwater paradise, filled with raised, well protected greens and tempting doglegs. 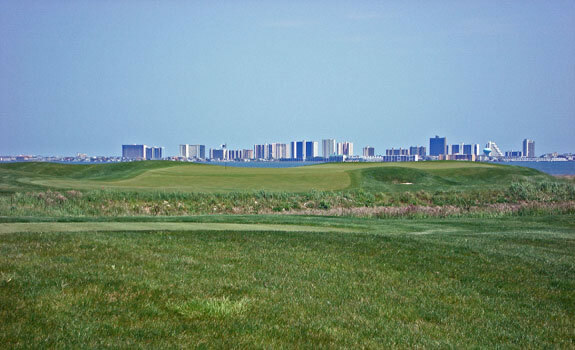 Part of the Ruark Golf stable and an absolute must when in Ocean City, Links at Lighthouse Sound is as much visually stunning as it is a stern challenge to all your game can produce. The unique double green shared by Holes 2 and 3 is a prelude to the stunning water holes. The Fourth is a fantastic dogleg right, shoreline hole. Played from the tees jutting out in the tide-marsh, a mighty drive must be played at the large tree on the edge of the fairway and hazard. The exposed green site is guarded by wind and water. The Par 3 Fifth is a brute. Played completely over tide-marsh a long iron or hybrid has to be struck pure to avoid the ever-present wind and forced carry. The walk to the back tees of Par 4 Sixth is worth the green fee alone. A narrow path of crushed shells and a beach littered with errantly struck golf balls brought back to terra firma by the waves foreshadows just how courageous you need to be on your tee shot. Don't miss right as the green falls off steeply. Hole Seven is a true three shot Par 5 having to cross a hazard twice. Bite off as much as you can on the dogleg right tee shot to welcome a risk reward second that can either lay up to the watery inlet or hammer a wood over to the generous landing area short of the green.